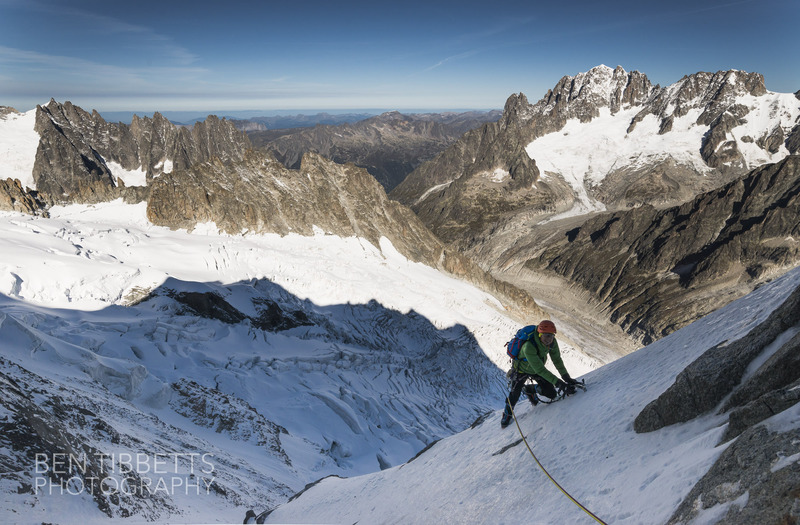 If you are interested in alpine climbing you have probably heard how damp the Alpine summer has been, but consequently how well formed with ice faces like the Grandes Jorasses have become this Autumn. Having been busy guiding all summer I haven’t had time to get on anything until this week. 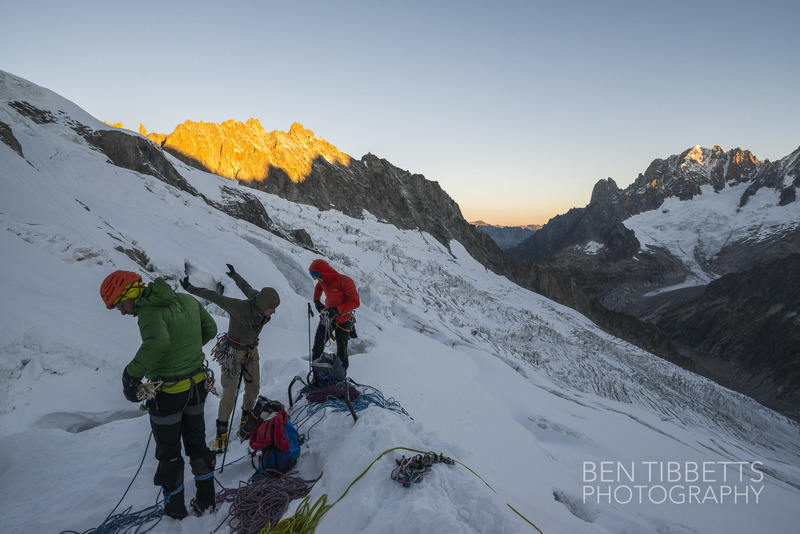 A perfect weather window formed over the last weekend so with Ross Hewitt, Misha Gopaul and Jeff Banks we headed up to Montenvers to bivi. 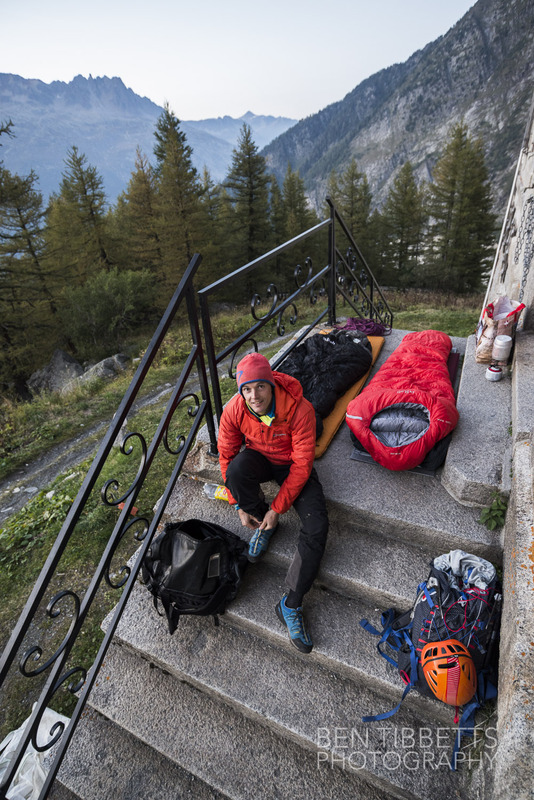 Ross preparing to bed down on the front steps of the Grand Hôtel du Montenvers. 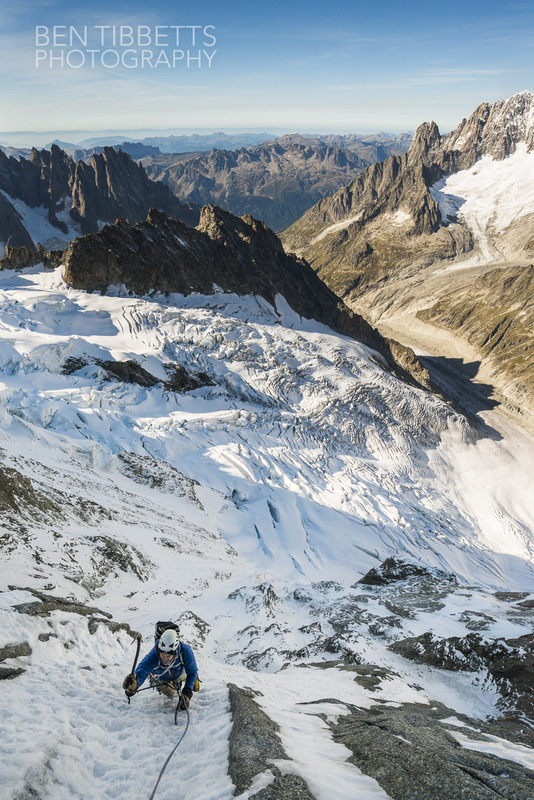 Rather than walk into the Lechaux hut (which we were sure would be full) the evening before, or bivouac uncomfortably beneath the face, we slept at Montenvers. 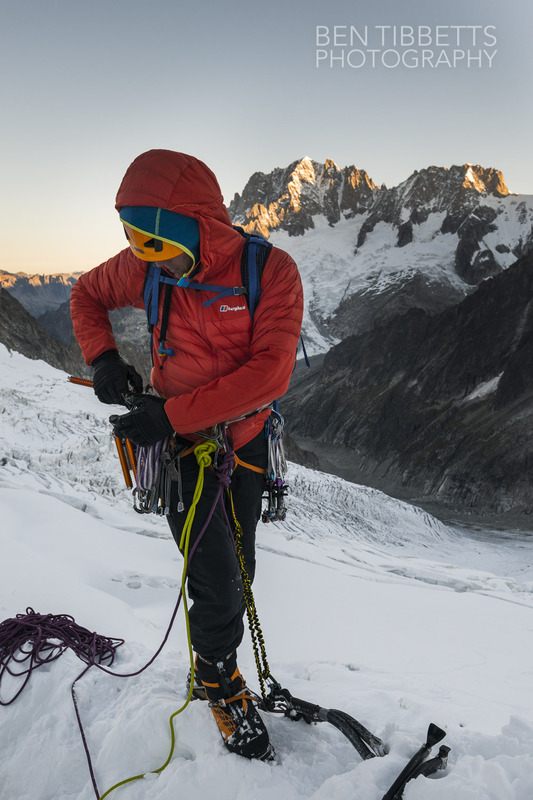 This allowed us to take luxury camping kit up on the train, have a nice meal and settle down to a warm night on the steps of the Grand Hotel and then stash our gear in the morning to avoid carrying bivi gear up the route. They even left the door open by mistake so we had warm toilets in the morning! 6am and lots of parties on Colton MacIntyre and Croz Spur already. 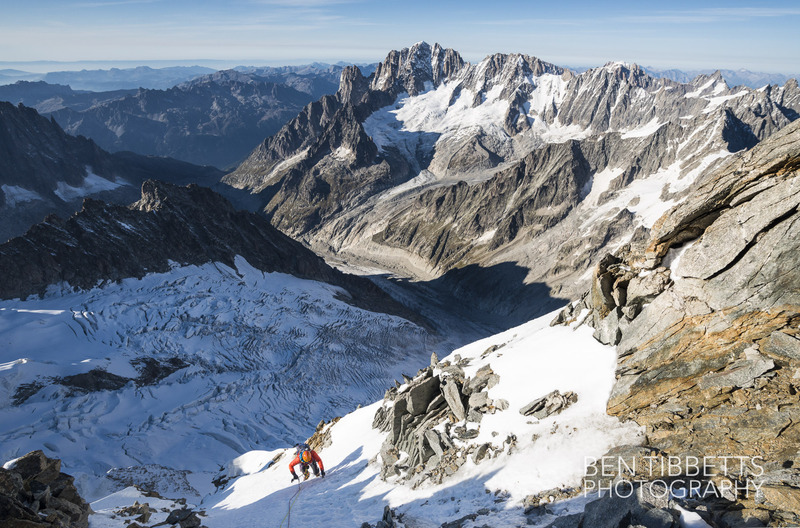 We left about 3am and walked fairly slowly up to the face, turning the last corner around 6am to get a full view of the face, and the numerous teams already high up on routes. 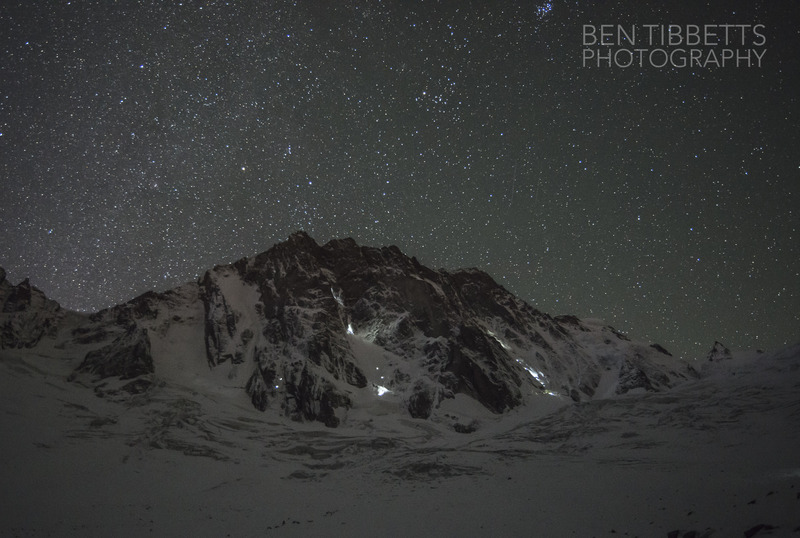 We later spoke to several teams, and the first team on the Colton Macintyre started the route at 11pm to avoid climbing below other people and risking taking falling ice in the face. Grim. 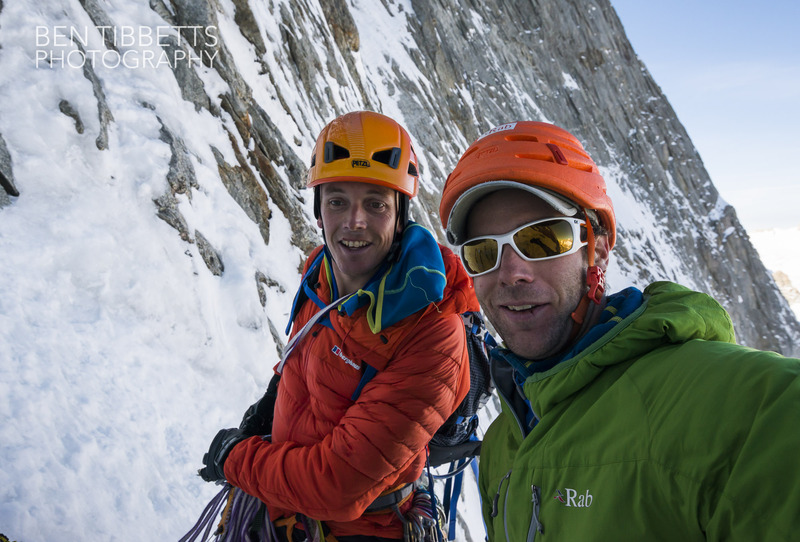 Myself and Ross had already climbed the Colton MacIntyre separately some time back and were interested in other routes. Seeing the popularity of the Colton Mac and the Croz Spur it was clear what to avoid! We decided to start up the Polish Route and see where conditions took us. Jeff Banks heading off to cross the bergschrund. 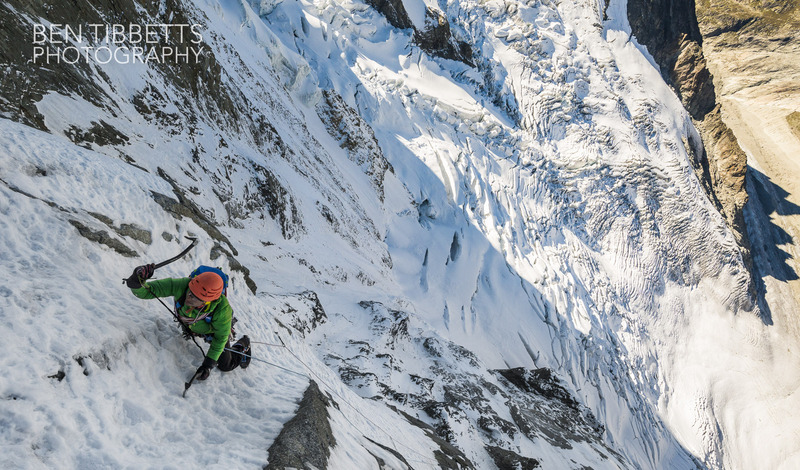 Ross Hewitt involved in the steep Weetabix bridging up the bergschrund! We got on the route about 8.30am. 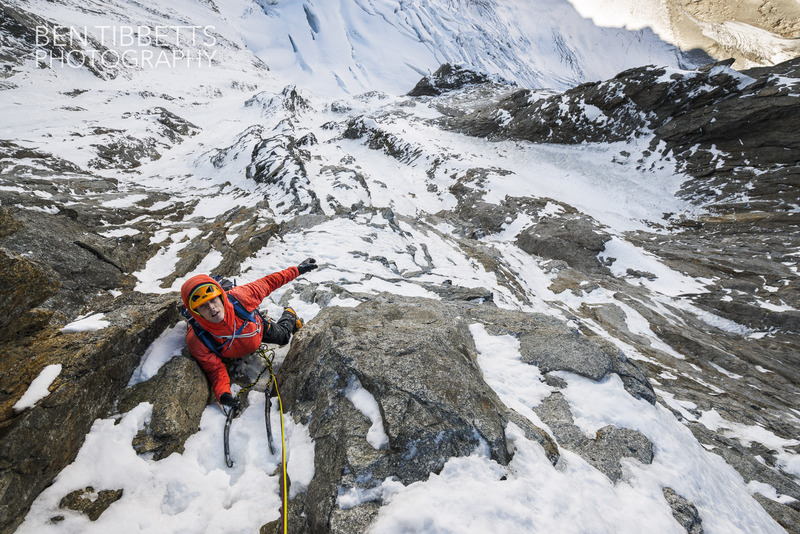 Misha Gopaul reaching the first belay, after c.300 metres of simul climbing. Ross Hewitt and… I don’t do selfies… not sure how this happened. Both with cut lips already?! 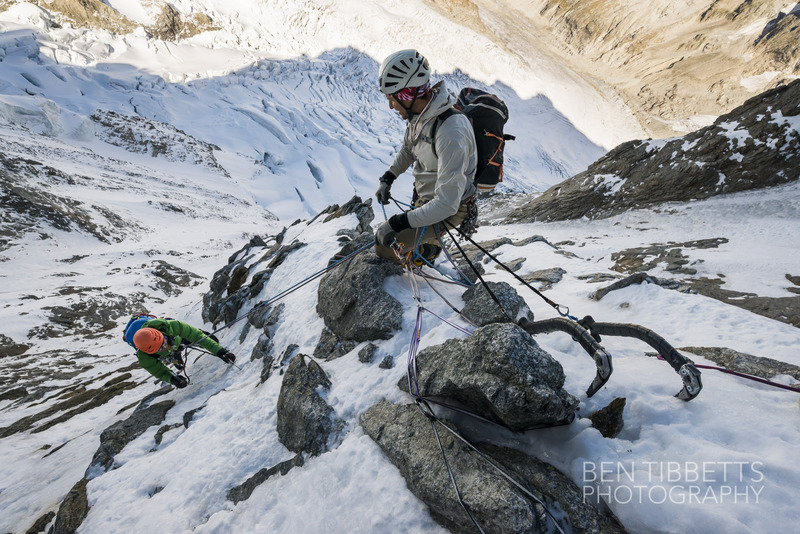 Jeff Banks taking up the rear… arriving at the same belay. Ross Hewitt on the first bit of steeper terrain. All pretty fun and mellow. At this point we caught up with a team of spanish who had started at 2am… There wasn’t a good place to pass them though for quite a while. In the meantime we managed to knit our 4 ropes together quite effectively. Jeff bringing Misha up to an uncomfortable stance! 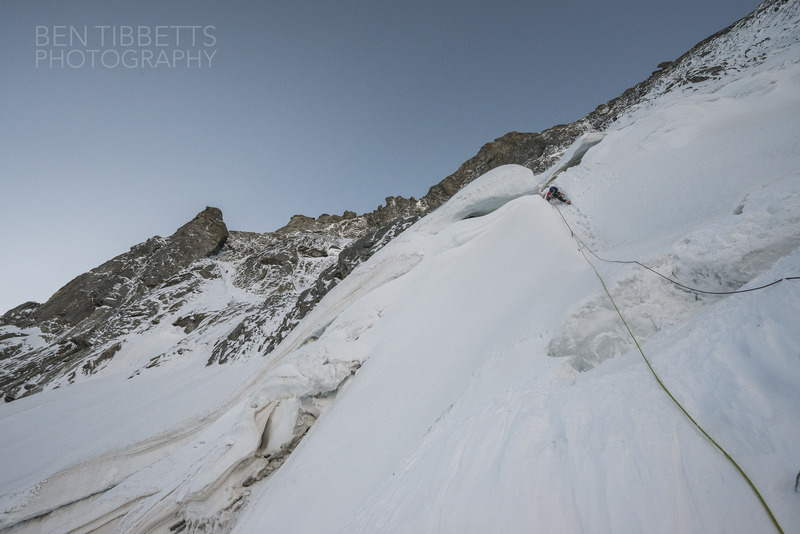 On the next two pitches, where Michto goes directly up to rejoin the traverse of the Polish route, the ice was a bit sugary and protection rickety. They were the only pitches that were a little engaging in current conditions, but still fun and technically pretty straight forwards. On these pitches we were all climbing on top of each other, meeting the Spanish, and the ropework got pretty ugly so I didn’t get any photos! 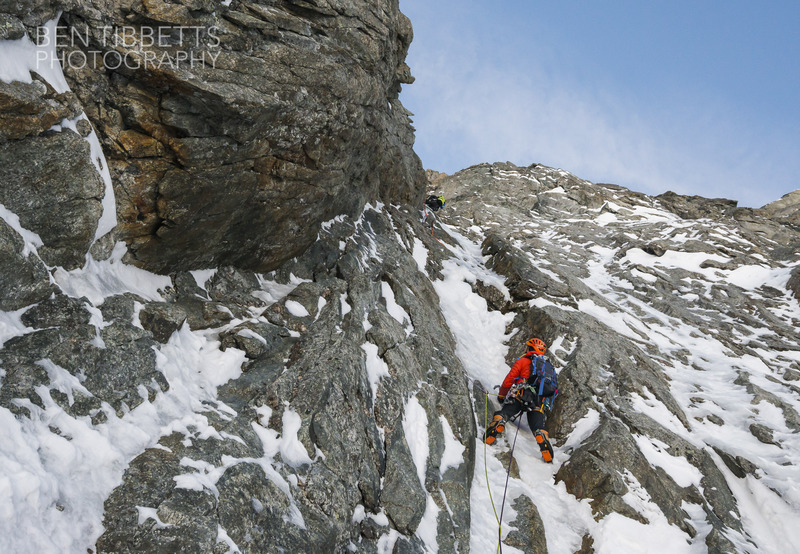 Me leading up the rickety corner… the camera is half the size of my rucksack! Without really knowing where we were and following the line of weakness we rejoined the traverse line of the Polish route. 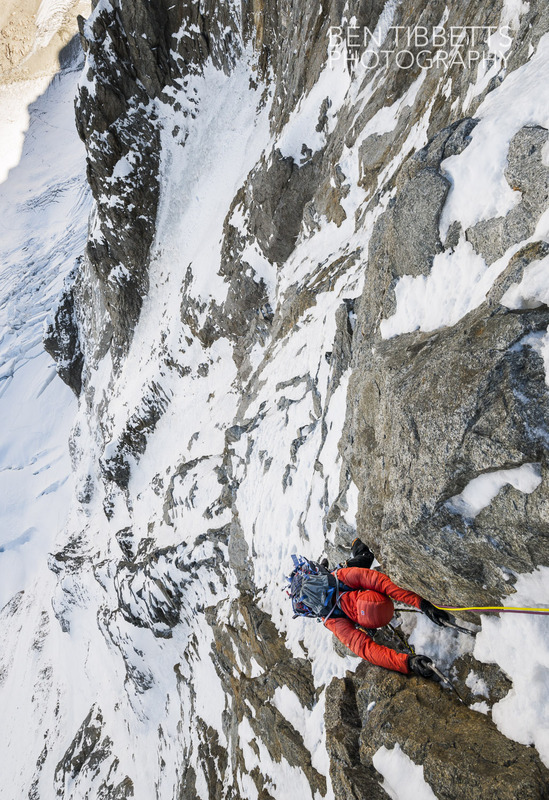 Once on this part of the face it is actually quite difficult to route-find, but quite easy to find a way. This section was fat with ice and took us on a ramp rightwards up towards the line of Belle Helene. 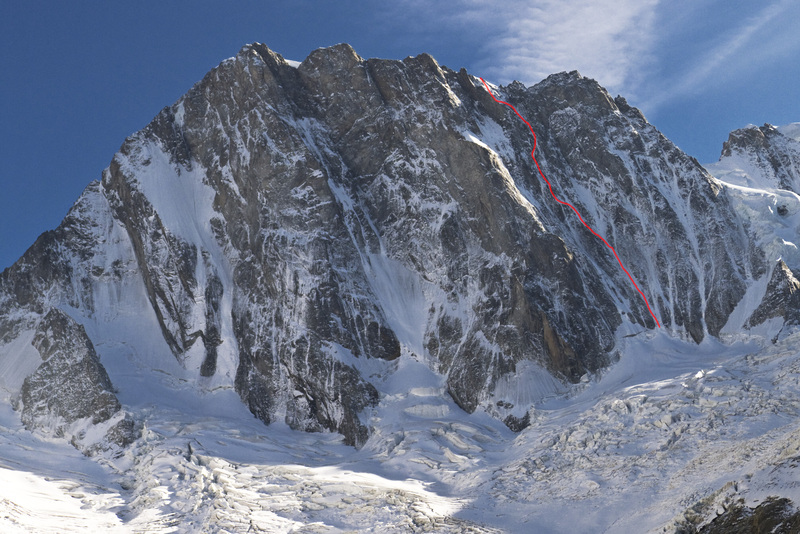 Misha at the end of the traverse. 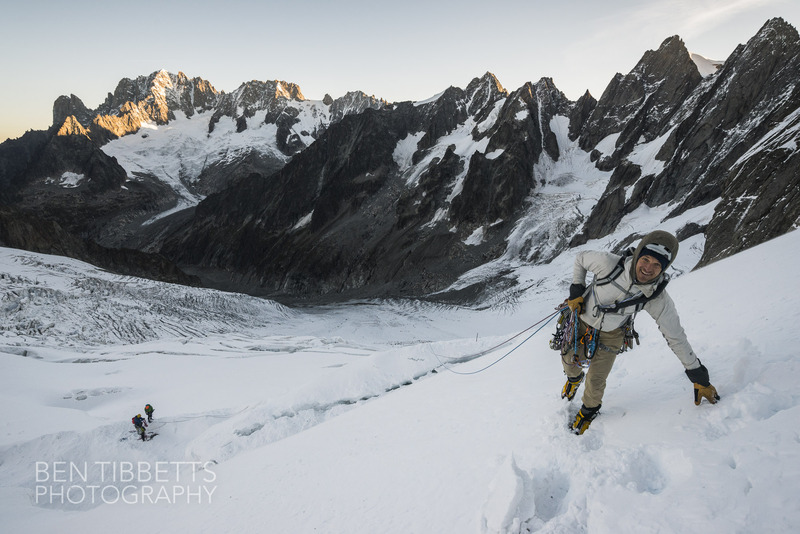 Jeff with the traverse down skiers right… Ben Briggs terrain?! From here on it was fairly mellow up several rope lengths of simul climbing then moving left up a ramp to finish on the ridge. Ross on the final slopes before the summit ridge. Next begins the descent. 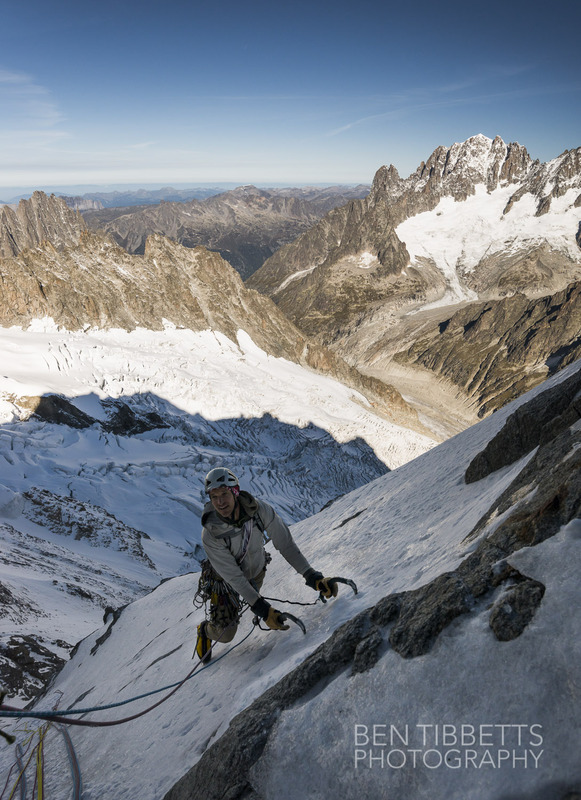 Having only been up the Jorasses twice I shall not wax lyrical, safe to say that the descent isn’t that much fun. 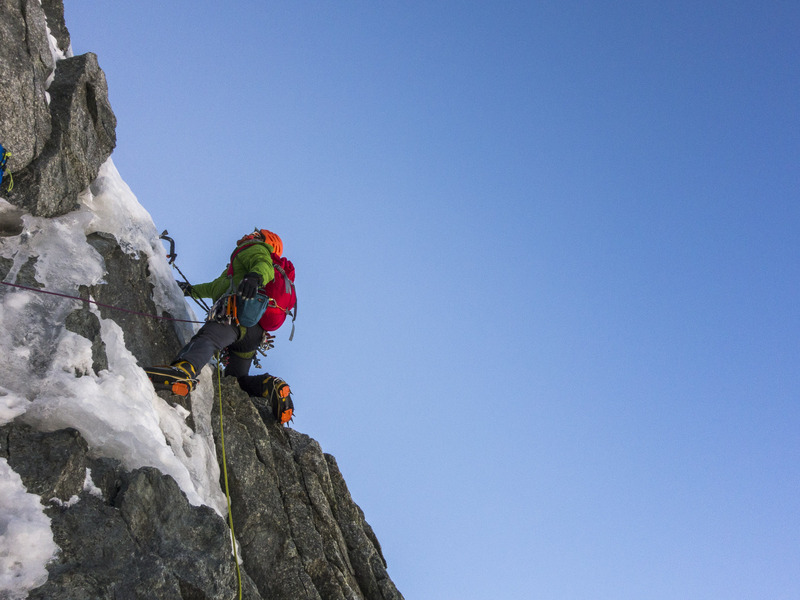 We traversed down and left amongst horrendously loose steep rock for a hundred metres to a blunt ridge. 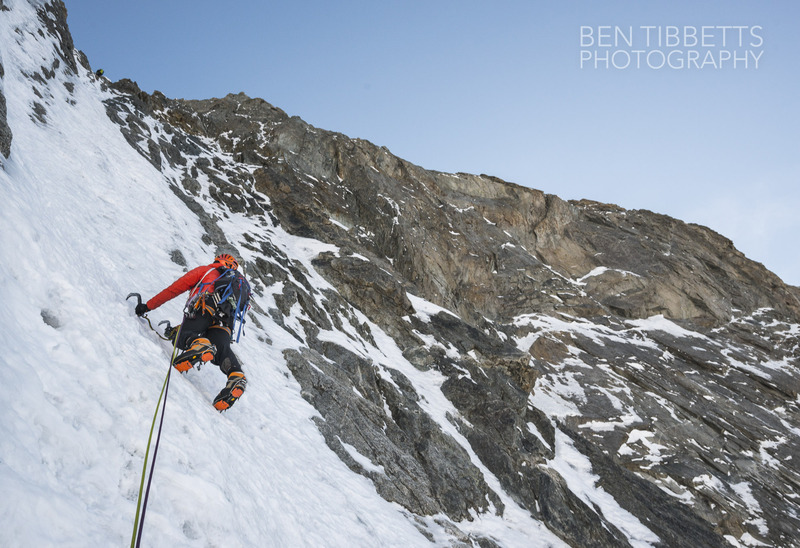 Next a few rappels, again on loose terrain and down a vague snow gully and finally over the bergschrund and down onto Glacier de Grandes Jorasses. It would be nice to do this upper section when the cold snow might hold it together, but realistically this is rarely an option. 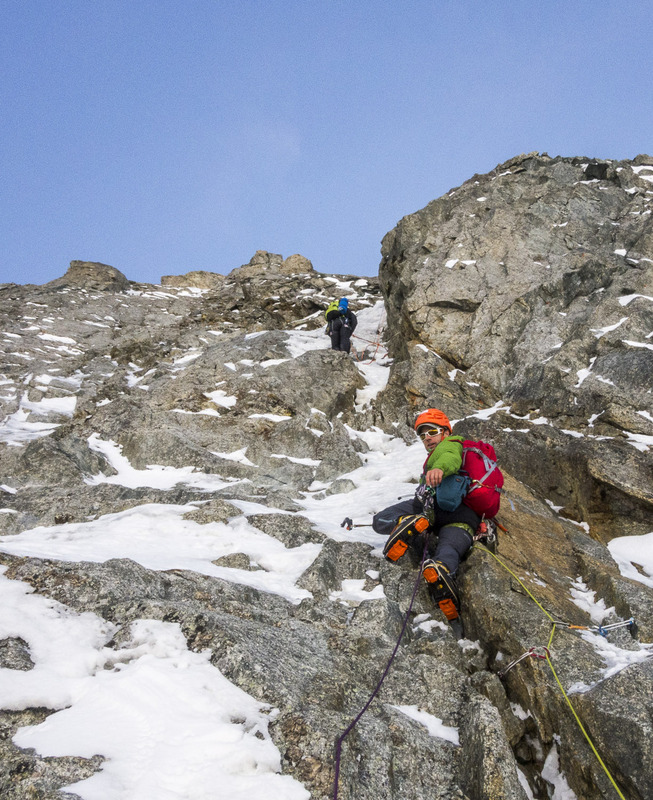 Below we hit the normal route, met up with Korra Pesce and Martin Elias who had just done Direct de l’Amitié… bravo! The long descent to the valley took us well into the night! 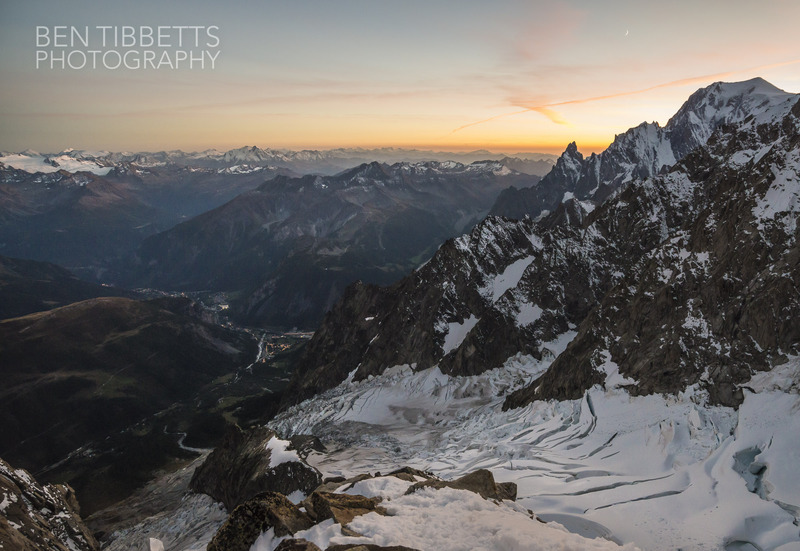 Twilight at the Rocher du Reposir. 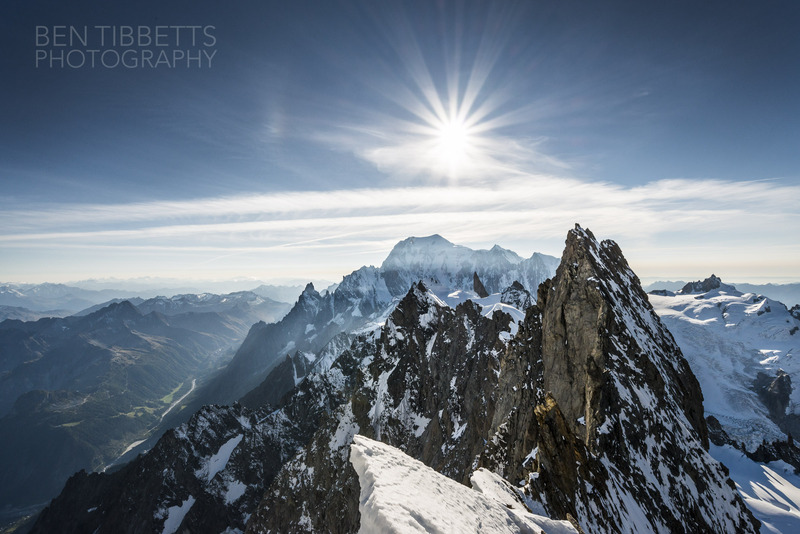 The Peuterey Ridge to Mont Blanc on the right skyline. Congratulations for these magnificent photos!!. Just one question. How do you know what time the Spanish Team started climbing?